Much like a little child who throws tantrums and rolls on the floor until you decide to pacify him, Nanda’s Tocky alarm clock operates on the same basis. When the alarm goes off, the clock will wriggle around on its spherical body until it rolls off the table. Then it careens around the floor and continues to blast out the alarm until you switch it off. The result is a sprint across the room and a game of catch to get you really wide awake early in the morning. When you are tired of the color, change the skin. Choose from the cool shades of white, aqua, orange, or kiwi. You can change the time on the touch screen clock face by spinning your finger around the dial. Customise the alarm by recording your favorite tune or your boss’ bark via the built-in microphone. 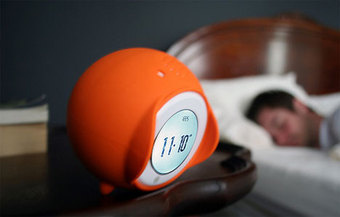 Tocky is the hipper and cooler version of its predecessor, Clocky, and makes alarm clocks more fun to use.